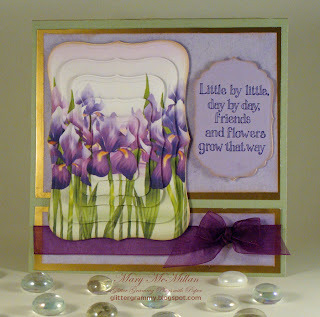 I have to thank Sherry for the inspiration for this card. She is a part of the Spellbinder Design Team. You can see her card here. Sherry is a blogger I've been following for over a year and her work is amazing. Sherry used Labels 11, which will be released at CHA. I used Labels 8, which I purchased from Karen and also Labels 4 for the Sentiment. My graphic is from Print Shop 22. 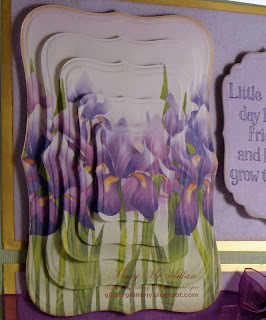 All card stock and ribbon were purchased from Paradise Scrapbook Boutique. I used Labels 8 to cut 5 layers of the graphic. If you go to Sherry's blog page she has a video on how she did it. I then followed the Mojo Monday sketch challenge to create my card. I turned the sketch 90 degrees for my layout and assembled it on a 6x6 format. I love it! I wish you a wonderful day and I look forward to seeing all the other entries into the Mojo Monday 122 Challenge. So amazing!I will defiantly have to try this technique! This is just stunning - what an amazing card!